Jeff and Hunter, two self-confessed nobodies in New York, make a pact: They will write an original musical and submit it to a festival. The only catch? The deadline is in three weeks! They gather their two actress friends, Susan and Heidi, and their accompanist and music director, Larry, on the keys. With the full team assembled, Jeff and Hunter hit another roadblock-- what should they write about? Jeff and Hunter decide to follow the old adage, “write what you know,” and set off on a unique musical adventure: writing a musical about writing a musical. As the deadline looms, insecurities creep in and jealousies flare. Will the team succeed with their musical? Could it even win a Tony?! In this intelligent, playful, lovable new musical, the audience is treated to an inside look at the tough work of being a creative artist. 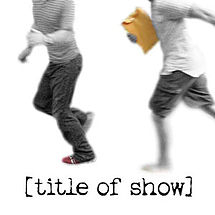 Frequently hilarious, occasionally heartbreaking, and thoroughly inspiring, [title of show] is a love story celebrating individuality and creativity. various locations, including an apartment in hell’s kitchen, a rehearsal room, and a broadway stage.